With the growing popularity of small water gardens and backyard garden ponds, AquA AnimaniA offers a wide range of quality pre-formed ponds for creating and maintaining beautiful water gardens. Each pre-formed pond can quickly be set up to produce an attractive water display almost anywhere around the backyard, sundecks or front porches. 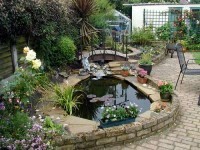 We also offer a variety of products that will help keep your pond clean and healthy. We carry a full line of pond kits, pre-formed waterfalls, pond decor, pond filters, pond pumps, pond lighting, pond maintenance and pond winterizing, as well as a healthy selection of pond fish and pond plants! Be sure to inquire, or visit our store and outdoor AquA Gardens in person, to see the complete pre-formed ponds selection we have available, in-stock. We can also special order unique items and other products from our vast network of national and international partners and suppliers.